Place the tea bags, sugar and boiling water in a medium heatproof bowl and stir to dissolve the sugar. Refrigerate for 30 minutes or until cooled. Remove and discard the tea bags. Place the tea in a blender. Add the lychees, coconut milk and lime juice and blend for 1 minute or until smooth. Pour into a 20cm x 30cm shallow metal tin and place in the freezer for 6 hours or overnight until frozen. Using a fork, rake the granita and return to the freezer until ready to serve. 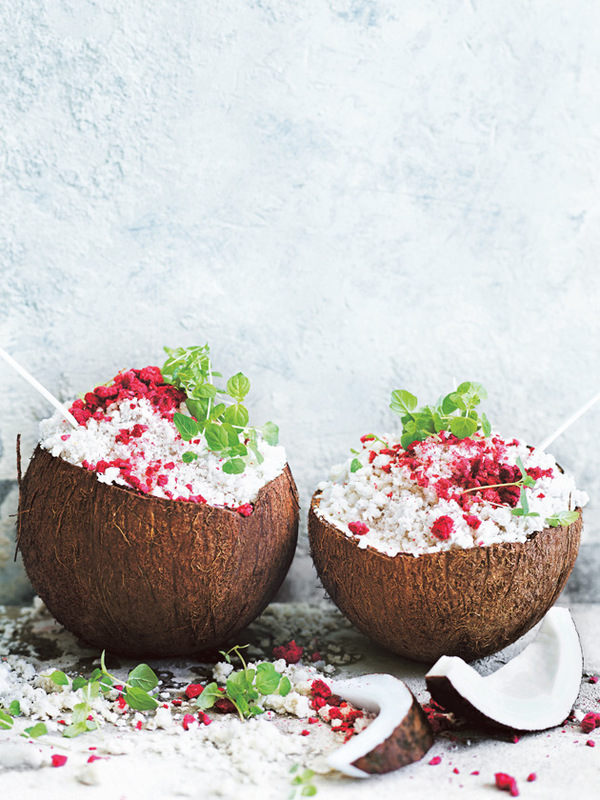 Divide the granita between glasses+ and top with the freeze-dried raspberries and mint to serve. Serves 6–8. + We served our granita in fresh coconut halves.